A convenient routine targeting key upper body muscles. These shoulder stretching exercises will help improve flexibility throughout your upper body. You can follow this routine every day to help relieve stress and tension from long hours reading, studying or working at your desk. For the best results with these exercises, stretch gently on the first try. Then increase to a moderate stretch on the 2nd and 3rd attempts. Stretch to the point of muscular tension, but not to pain. If you can't wait until the stretch is over, back off a little bit--your stretch is probably too strong. Follow the instructions below closely and maintain good body alignment as you stretch. Scroll to the bottom for thumbnails of the full routine. Place both hands behind your head with your fingers interlocked. Sit upright and expand your chest. Point your elbows out--try to get them in line with your ears. Next, side tilt your neck and back to the L for a R side stretch, then tilt to the R for a L side stretch. Follow an even curve through the spine as shown, stretching both your neck and your sides. Cross your arms behind your back with your L hand on top. Then lift your chest and tighten your abdominals so that you feel the stretch in the front of both shoulders. Repeat 3 times and then switch arms so that the R hand is on top. Reach your L arm overhead with the elbow bent. Grab your L elbow with R hand, then gently push L elbow back to stretch the back of the upper L arm. Hold 5 seconds. Repeat on the opposite side. 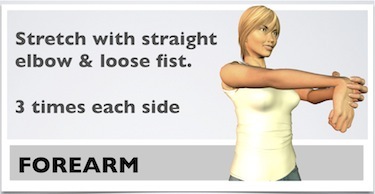 Make a loose fist with your L hand and straighen your arm. Stretch your L hand toward the floor. Hold 5-10 seconds. 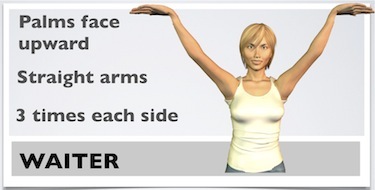 Reach both arms overhead in a V shape. Hold your palms facing the ceiling as if you’re holding a tray in each hand. Hold 5-10 seconds. Kneel about 12-18 inches in front of a sturdy chair or couch. (Place a folded towel under your knees) Reach both hands back to the chair with palms facing down.Activate your abdominals and lift your chest until you feel a stretch in both biceps muscles. You may also feel a good stretch for your abdominal muscles with this exercise. Hold 5-10 seconds, bend forward to release the stretch, then repeat. Grab your L arm behind your back and gently pull it downward as you tilt your head to the right. Repeat on the other side. Cross your R arm over your L, touching your palms together. Reach over the side of your L leg. Then look down and bend forward, turning to the L. Repeat on the other side. 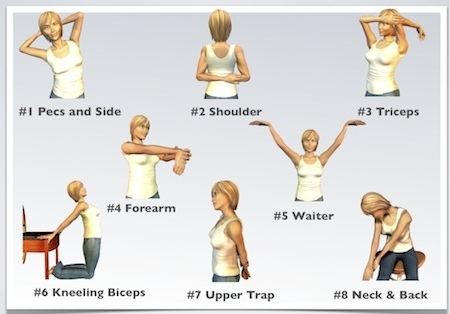 Hope you enjoyed this routine of shoulder stretching exercises. Try my article on back stretching exercises too. Return from shoulder stretching exercises to physical therapy exercises.